Balaton (Plattensee in German) is often affectionately referred to as the Hungarian Sea. It is the largest lake in Central-Europe where all members of the family will find something to do whether it's bathing, sailing, horseriding, playing golf or wine tasting. Children can enjoy playing in the water for hours. Adolescents plunge into the lively and exciting nightlife (club attaca :-)). Hikers praise the idyllic countryside in the Balaton Uplands National Park. Painters and photographers admire the harmony of the lake, volcanic hills and vineyards. Wine lovers eulogize the white wine from Badacsony while gourmets can’t resist to the scent of the grilled zander. The length of the lake is about 79 kilometers and its width is between 1.3 and 14 kilometers. The surface of lake Balaton gets more than 2000 hours of sunshine a year, and since the lake is shallow, its temperature rises fast. In the middle of the summer it can get as warm as 26-29 degrees. However during colder winters the lake's surface freezes. At lake Balaton the weather can change quickly and storms with waves of 2 meters are frequent. A storm alert system around the lake has been created to warn beach-goers of such storms. 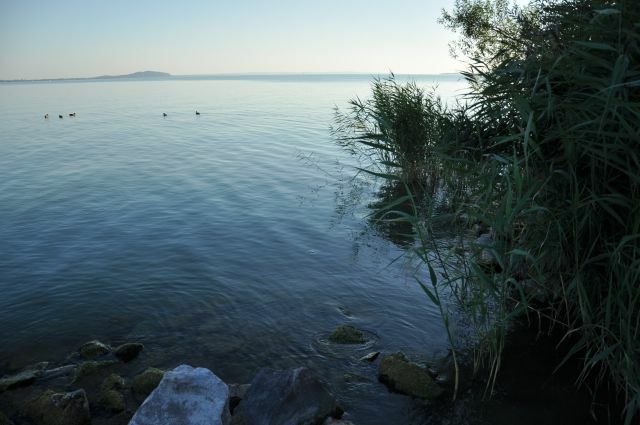 There are over 1400 different species in lake Balaton and around it. The lake is much shallower in the south. The climate around Lake Balaton has also made the region ideal for viniculture. The lake, acting as a mirror, greatly increases the amount of sunlight that the grapevines of the region receive. Badacsony and its white wine (kéknyelű) is the most famous of the region, but you can see vineyards, and find atmospheric wine cellars all around the lake. Lake Balaton and its surroundings are the most visited tourist region in Hungary besides Budapest. 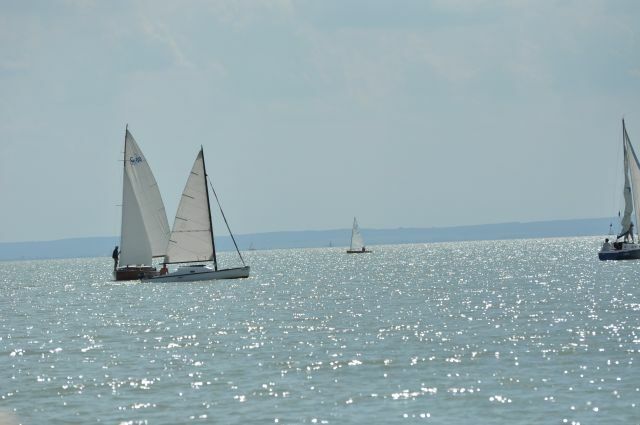 The two main events of the season are the cross Balaton swim and the Blue Ribbon sailing race.